Sergio Pitol is a legendary Mexican writer, whose ability and fame are best explained by noting that he has won both the Herralde and Cervantes Prizes. Scandalously, none of his novels have appeared in English thus far, but this year saw the publication in English by Deep Vellum Press of the first in his trilogy of memoirs. The Art of Flight (translated by George Henson, review copy courtesy of the publisher) is, then, the first lengthy exposure the Anglophone world has had to Pitol – and it’s certainly not a bad place to start. Pitol, by all accounts, must be excellently shaped, as he has lived through a whole variety of times and interests – all of which makes for a wonderfully entertaining series of vignettes. Next, we move on to ‘Writing’, a section in which Pitol offers the reader insights into his art. From the origins of his passion, a house of books far from the bright lights of the capital, we follow him as he explores literature, finding like-minded writers in Mexico City before ending up somewhat randomly in Barcelona. 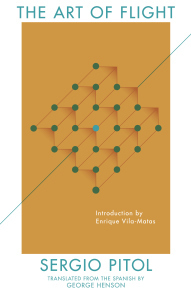 It’s here that he begins a long and successful career, writing in the midst of a cultural boom (one story here tells of his meeting with Jorge Herralde and the founding of the famous Anagrama publishing house). The third section is entitled ‘Readings’, and if any reader is still clinging to the image of a man awed by giants, it’s here that this misconception is shed. Pitol shows the breadth of his learning and thinking in a series of lengthy essays on books and writers, among them Jaroslav Hašek’s The Good Soldier Švejk, Thomas Mann’s diaries and Jerzy Andrzejewski’s The Gates of Paradise. Pitol proves to be incredibly erudite, a multilingual master of words and a translator into Spanish from several languages – these pieces make for fascinating reading. You can learn a lot about a man from his admirers, and (unsurprisingly) Pitol appears to have plenty. In a contribution to Granta’s Best Untranslated Writer series, Valeria Luiselli extols his virtues, remembering her introduction to his writing (and there are definite echoes of Pitol’s memoirs in Luiselli’s Sidewalks, especially in her writing about Venice). In addition, the foreword of The Art of Flight is provided by none other than Enrique Vila-Matas, an excellent piece in praise of a man who sees things slightly differently to the rest of us. Also, as I mentioned above, The Art of Flight is not a book to race through. While I spread my reading out over five or six days, which is a long time for me for a book of this length, I really should have taken longer. With many short sections which can be read perfectly well in isolation, this is a perfect coffee-table work for the literary-minded, a book to be picked up whenever you have ten minutes or so to be filled. Its great he is finally in english I know for years he was on a list of writers that shoulld be translated , I must pick a copy up of this it sounds great . Such a great book and such a great writer, Tony. Pitol’s exuberance, his sense of humor, and his erudition are such a winning combination–so glad this trilogy is finally making its way into English! Tony – great to know about this. I have the book in a French translation (Richard has championed Pitol quite a bit), but have yet to read it. At this point it makes more sense to read the English translation.